OAKLAND: Golden State’s Andre Iguodala earned the NBA Finals Most Valuable Player award last year for coming off the bench and playing smothering defense on LeBron James and the Cleveland Cavaliers. One year later, the Warriors are again facing Cleveland for the league crown and the Cavaliers still appear to have no answer for the disruptive force of the 32-year-old US swingman. Iguodala scored 12 points, grabbed seven rebounds, passed out six assists, made a steal and blocked a shot while playing 35 minutes off the bench for Golden State in a 104-89 victory over Cleveland in the first game of the NBA Finals. “He’s an incredible two-way player,” said teammate Klay Thompson. “His numbers might not jump off the page, but you know how important he is to our team. He was finals MVP for a reason last year. His defense is second to none. He’s a great competitor. I get better just learning from him every day.” The Warriors’ bench outscored Cleveland’s reserves 45-10 and Golden State forced 17 Cavaliers turnovers that produced 25 points. And when Iguodala was on the court, the Warriors outscored Cleveland by 21 points, a game high for any player. “He’s amazing,” said Golden State’s Stephen Curry, the two-time regular season NBA Most Valuable Player. “Me and Draymond (Green) talk about it all the time. When we’re on the bench, we watch it. It’s unbelievable. “He has great timing, great eye-hand coordination, and obviously his wingspan works to his advantage to be able to close that space up. But it’s really uncanny the way that he can do it without fouling.” Iguodala is also the mellowing influence for a club that won an NBA record 73 games this season but can sometimes push the pace too fast, too long for its own good. “I normally try to keep an even coolness about myself. Not just for me, but for the team as well,” Iguodala said. “We can kind of get giddy out there and lose it a little bit, so I try to get us back to that even balance. That’s pretty much my role on this team.” That calm was tested when Cleveland guard Matthew Dellavedova struck him in the crotch while attempting a steal. Iguodala stared down the Australian but was not critical after the games. Iguodala and Green kept four-time NBA MVP James to 2-of-9 shooting when they were guarding him, part of a 9-for-21 night by the standout in his sixth consecutive NBA Finals. “Everyone who came off the bench treated every possession like it could be their last. 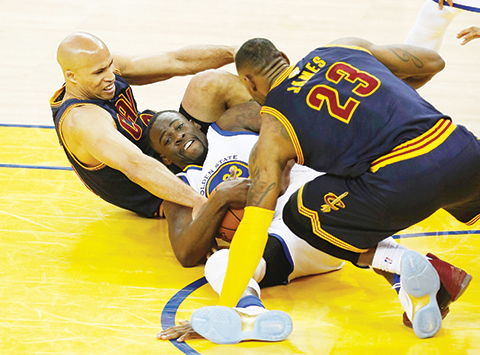 When you treat the game like that and respect it, good things tend to happen,” Iguodala said. “You’re in a situation right now where it seems like everything is do or die.